Surprise your partner with this extravagant cruise, perfect for a special Marriage proposal idea, or surprising a family member with a Cant-Be-Missed Banner along the side of one of our vessels in the pool of London, beside Tower Bridge. Then board the boat at Saint Katherine's Pier and cruise back to Westminster Pier for the world to see, celebrating with a bottle of Fench Champagne arriving back below Big Ben. Can Be Used For: Marriage Proposals, Milestone Birthday Celebrations, Wedding Anniversaries and Special Occasions. The banner affixed to this 120 foot super sightseeing motor vessel (this vessel is twinned decked with the upper deck completely open). The banner will be 30 feet in length. The banner is placed be on the starboard side at the front part of the boat. As you walk along Tower bridge with your partner, and stop in the centre of the bridge, our boat will be waiting below the bridge displaying your personalised banner. A great way to propose to your partner. The one-off banner would be mailed to you next day by Royal Mail, after your cruise. Images taken by the Admiral Enterprises Assistant will be e-mailed next day. 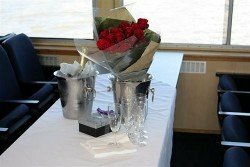 Champagne, fresh red roses and Belgium chocolate will be waiting on the boat for you to celebrate with. The vessel is for the client's own use for this one-hour cruise only. This is a private hire and is use for the purpose of a your celebration only, whether that's proposing to your loved one celebrating a birthday or any other special occasion. The boat arrives on the left side of the river. The recipient must stand in the middle of the Bridge facing towards London Bridge and London Central. The boat then turns in front of the bridge with the banner in full view. The clients can of course bring their own photographer. This celebration cruise operates in the morning at the given time. There are other times available in the afternoon on certain days. Once this cruise is booked it is not refundable. The Client must allow ample time to comply with the timings. Tickets will be posted within a few days of receipt of payment. Once tickets have been booked and issued they cannot be cancelled or exchanged and no money will be refunded. The company reserve the right to change the menus where and when necessary without prior notification. Other unavoidable changes will be notified as soon as possible. There are no boats currently available for this tour.